Ever have that moment where you’re going to leave a party and you can’t find your keys and a small panic sets in? Okay, now imagine that feeling . . . but this time, you’ve lost 40–60 jars containing 100 human brains just sloshing around in formaldehyde. Yikes. There was a small scramble this week to figure out the whereabouts of said 100 brains at the University of Texas at Austin. They were discovered missing when a local photographer who had been documenting the brains for a photo book started asking questions. The brains were half of a collection the school received in the ’80s, and when no one could confirm their location, there was some confusion and misreporting as to whether the specimens had ended up at UT’s San Antonio campus. Luckily, after a rather quick investigation, it turns out it was all a false alarm. Phew! UT looked into the matter and found that school environmental health and safety officials had safely disposed of the specimens more than a decade ago, in 2002. The brains were trashed after faculty declared they were not in good enough condition to warrant research or to be used in classrooms. But don’t you worry—UT has brains to spare! They still have 100 specimens left. On Wednesday the school released a statement describing those findings, but they also said they “are continuing to investigate reports that additional brain specimens were separately sent to other universities or health institutions.” They also refuted claims that one of the missing brains belonged to a man named Charles Whitman, who terrorized the school in 1966, killing 16 people and wounding many others in a shooting spree. 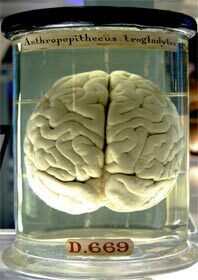 So why did University of Texas researchers have a closet full of brains in jars? (True story. They actually kept them in a closet.) Well, like most neurological research facilities, they used the brains to study conditions such as strokes, mental illness, and diseases such as Huntington's and Parkinson's. The specimens originally came from Austin State Hospital, a psychiatric facility, in 1986. Remaining brains will still be used in an academic capacity—and, I’m sure, carefully monitored, should they be moved. If you’re curious about the brains (at least the ones that survived past 2002), you can check out photographer Adam Voorhes’ book, Malformed: Forgotten Brains of the Texas State Mental Hospital, which comes out soon.